Antimatter refers to matter that is similar to ordinary matter but has the opposite electrical charge from what is seen in regular matter. Electrons have a negative charge of -1, positrons, which are anti-electrons, have a positive charge of +1. Similarly, protons posses a charge of +1, and antiprotons have a charge of -1. Inside protons and neutrons there are quarks. There can also be antiquarks and so on. When a particle and its associated anti-particle get too close to one another they mutually annihilate and all of their rest mass energy is converted to radiation or other particles, in accordance with E = mc2. For example, the electron has a rest mass of 511 keV (1 keV is one thousand electron-Volts, where the energy of 1 eV is that of moving an electron through a potential of one Volt.) When an electron and positron (anti-electron) annihilate, two gamma rays are produced each with energy around 511 keV. 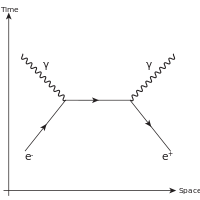 See the figure below, which is the Feynman diagram for the interaction. In the case of electron-positron annihilation, this is the only outcome possible due to the low energy of the two annihilating particles. The big mystery is why there is matter in the universe at all! Why did not the Big Bang produce equal amounts of matter and anti-matter? In such a case the matter and anti-matter mutual annihilation process could have left little or no matter behind, and stars, galaxies, planets and people could not have formed. Cosmologists and particle physicists believe there was some small excess of matter over anti-matter, such that our present amount of matter remained after all the annihilation processes were finished. This excess of matter over anti-matter is thought to be due to some asymmetry in the laws of physics. In general the laws are highly symmetric. Particle physicists look to understand the degree and nature of any putative asymmetries. One way to do this is by studying neutrinos, very low mass electrically neutral particles which are signatures of the weak nuclear force and products of radioactive decay. The neutrino mass is less than 2 eV, much, much less than the already small electron mass. There are believed to be 3 types of neutrinos – electron neutrinos, muon neutrinos and tau neutrinos – which are in turn associated with the electron, muon and tau particles; the muon and tau are ‘heavy’ members of the electron family. If the neutrino has non-zero mass, then through a quantum effect known as “neutrino oscillation”, the different types of neutrinos mix together. This is due to the wave nature of all particles in quantum mechanics. Neutrinos have been detected from the Sun for many years, but at a much lower rate than initially expected, which was an outstanding puzzle. The “neutrino oscillation” mechanism resolves the discrepancy. Also, differences in neutrino and antineutrino interactions, which are due to neutrino oscillation, are thought by many particle physics to be related to the excess of matter over antimatter in the universe. There are 3 parameters of the “neutrino oscillation” theory, which are known as ‘mixing angles’, and two of these, θ12 and θ23, have been reasonably well measured. The third mixing angle, known as θ13, is has not been well measurable until very recently. Particle physicists working as part of the US-Chinese collaboration at the Daya Bay experiment have announced in March 2012 a positive result for the third mixing angle. It is based on measurements made near two nuclear reactors in China, one at Daya Bay and one at Ling Ao. Nuclear reactors are strong sources of antineutrinos. Another similar experiment, known as RENO, is based at a six-reactor nuclear power site in Korea. As of April 2012 the RENO physicists are also claiming a positive measurement of the θ13 mixing angle parameter, with a similar level of statistical confidence in excluding the zero value hypothesis. Both experiments are indicating a value of around 0.10 for the mixing angle parameter, satisfying the expression sin2 (2θ13 ) = 0.1. Other experiments include T2K in Japan, MINOS in the US and the Double Chooz international collaboration based in France. All three are seeing hints of a positive value of θ13 as well, but none have reached the statistical confidence level of the Daya Bay and RENO experiments. The value being measured is surprisingly large, and thus very supportive of the neutrino oscillation theory for the matter vs. anti-matter discrepancy. These are exciting times for oscillating neutrinos and these experiments are moving us to closer to solving the antimatter quandry! This entry was posted on Tuesday, June 5th, 2012 at 7:56 pm	and tagged with annihilation, antimatter, Dark matter, neutrino oscillation, neutrinos, nuclear reactors and posted in Dark Matter. You can follow any responses to this entry through the RSS 2.0 feed. « Gamma Ray Line at 130 GeV in FERMI LAT Possible Dark Matter Signal?